*Discounts calculated against RRP of £11.95. by Royal Mail International Tracked and Signed. 1000mg of fish body oil per capsule. - 120mg is DHA (Docosahexaenoic Acid). Sourced from fatty fish (such as sardines, sprat, salmon, mackerel). (*Arthritis Research UK website for rheumatoid arthritis). Save up to 40% on the RRP of £11.95. Mix and Match supplements to qualify for the full 40% discount. Fast and Free UK delivery by Royal Mail First Class post. 30-day no quibble refund guarantee for your peace of mind. The table below shows the amount of each nutrient present in each capsule. Omega-3 inhibits blood clotting so consult your doctor before using if you have a blood disorder or if you are taking anticoagulant medicine. Do not take omega-3 fish body oil in the two days before or after surgery. Q. Is Fish Body Oil Good for Rheumatoid Arthritis ? A. 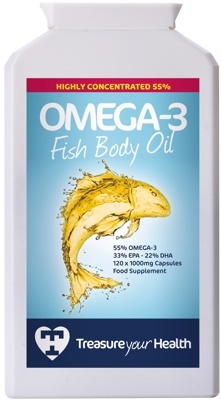 Fish body oil contains significant Omega-3 essential fatty acids, which are strong anti-inflammatories. Omega-3 significantly reduces the release of several elements that play a part in inflammation from your white blood cells. Omega-3 also form the building blocks for prostaglandins, which control your immune system and fight joint inflammation. Significantly decreased the number of tender joints. Shortened the duration of morning stiffness. Q. Fish Body Oil or Fish Liver Oil - What is the Difference ? A. Fish body oil is created from tissues of fatty fish such as sardines, sprat, salmon, and mackerel. Fish liver oil is created by pressing the cooked liver of halibut, shark or, more commonly, cod. Q. What Are The Traditional Uses for Fish Body Oil ? A. Traditional uses for fish body oil include rheumatoid arthritis, helping maintain a healthy heart and circulation, general cardiovascular health, high blood pressure, anti-inflammatory, heart arrhythmias, asthma, lupus, psoriasis, IBS, ulcerative colitis, Crohn's disease, Raynaud's disease, menstrual cramps.